Chase Cunningham recently returned from the World Championship where he placed in the Top 4. He earned his invite to that event by getting second at the North American WCQ, a feat not many can say they’ve accomplished. 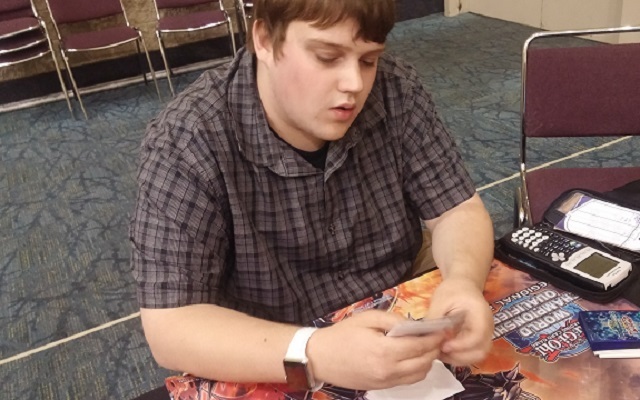 He’s here today playing the same Deck that took him so far at the NA WCQ: Burning Abyss. 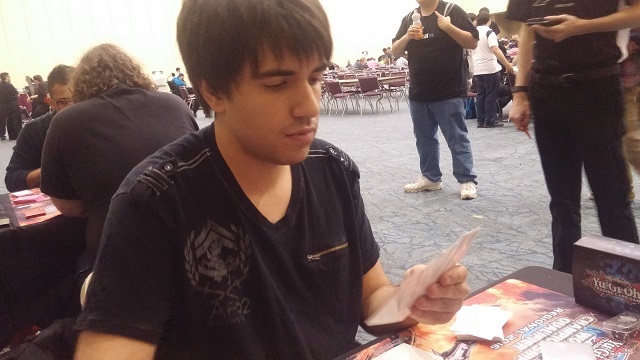 His opponent is Matthew Chicas piloting the popular Performage Shaddoll Deck. Chicas won the die roll and opted to go second. Cunningham opened with two Karma Cut, Graff, Malebranche of the Burning Abyss, Breakthrough Skill, and Dark Hole. He Set his three traps and passed. Chicas activated El Shaddoll Fusion sending Performage Trick Clown and Shaddoll Falco to make El Shaddoll Construct. He sent a Shaddoll Squamata to the grave and Special Summoned the Shaddoll Falco and Trick Clown. Shaddoll Squamata sent Shaddoll Beast which gave him a draw. El Shaddoll Construct attacked and Chase used Karma Cut discarding Graff, Malebranche of the Burning Abyss to banish it. He Special Summoned Cir, Malebranche of the Burning Abyss from his Deck in attack position. Chicas Set a backrow and ended. Cunningham drew Torrential Tribute. 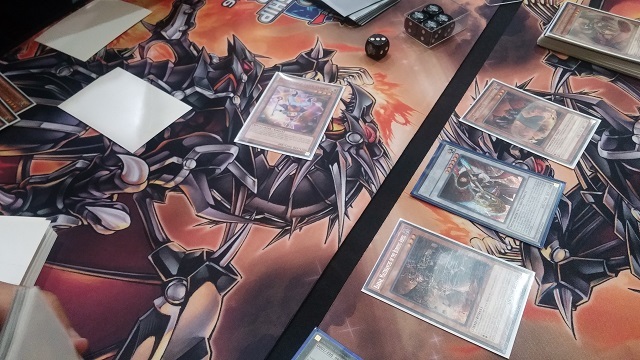 Cir, Malebranche of the Burning Abyss attacked Trick Clown and Chicas brought it back by taking 1000 damage. Cunningham Set Torrential Tribute and passed. Chicas Normal Summoned Mathematician and sent Shaddoll Squamata to the grave, which sent a Shaddoll Core to add back El Shaddoll Fusion to his hand. Then he activated Shaddoll Fusion sending Trick Clown and Shaddoll Falco to the grave to bring out El Shaddoll Construct. He sent Beast to the grave and brought back his two Fusion Materials after dropping to 5000 Life Points. Cunningham responded with Torrential, and Chicas used El Shaddoll Fusion to bring out El Shaddoll Winda. 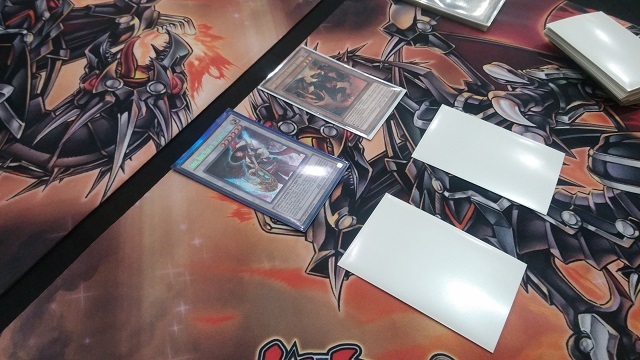 The dust Settled and the board was cleared, Cunningham bring back Graff, Malebranche of the Burning Abyss with Cir, Malebranche of the Burning Abyss and Chicas added back El Shaddoll Fusion with El Shaddoll Construct. El Shaddoll Winda attacked Graff, Malebranche of the Burning Abyss but Cunningham used Karma Cut discarding Dark Hole to get it off the field! Chicas Set a backrow and ended. Cunningham drew Vanity’s Emptiness. He entered the Battle Phase and attacked with Graff, Malebranche of the Burning Abyss to which Chicas responded with El Shaddoll Fusion. He sent Effect Veiler and Shaddoll Falco from his hand to bring out Construct, and Cunningham used Breakthrough Skill to negate its effect. Shaddoll Falco Special Summoned itself and Cunningham attacked it with Graff, Malebranche of the Burning Abyss but Chicas had Book on Moon to flip it face-down. Cunningham Set Emptiness and passed. Chicas flipped Shaddoll Falco to face-up attack position and Set El Shaddoll Construct from his grave face-down. He then Synchro Summoned Leo, the Keeper of the Sacred Tree. El Shaddoll Construct added back Shaddoll Fusion. He Set one backrow and passed. Cunningham drew Scarm, Malebranche of the Burning Abyss. He passed. Chicas used Sinister Shadow Games in the End Phase to send Shaddoll Hedgehog which searched Shaddoll Beast. Chicas Flip Summoned El Shaddoll Construct and then played Foolish Burial to send Performage Damage Juggler. He banished it to add Performage Hat Tricker. He activated Shaddoll Fusion using El Shaddoll Construct and Beast to Fusion Summon El Shaddoll Winda. He added El Shaddoll Fusion back to his hand and draw a card. El Shaddoll Winda attacked over Graff, Malebranche of the Burning Abyss which brought out Scarm, Malebranche of the Burning Abyss. Leo attacked over that, and Chicas Set two cards before ending his turn. Cunningham added Graff, Malebranche of the Burning Abyss to his hand in the End Phase. Cunningham drew Fire Lake of the Burning Abyss. He Set Scarm, Malebranche of the Burning Abyss and Fire Lake before ending his turn. Chicas said “Man, these top Decks just keep getting better” and Special Summoned Black Luster Soldier – Envoy of the Beginning! He banished Cunningham’s face-down Scarm, Malebranche of the Burning Abyss and attacked with Leo and Winda directly. Cunningham drew Mind Crush. He thought for a moment before scooping up his cards, headed into a second game. Cunningham just couldn’t see enough monsters in the early portions of the duel and as a result got beat down by several of Chicas’ Fusion Monsters. Chase opted to go second. Chicas Set a backrow and ended. Cunningham opened with three Scarm, Malebranche of the Burning Abyss, Graff, Malebranche of the Burning Abyss, Mathematician, and Fire Lake of the Burning Abyss. He Normal Summoned Mathematician and sent Libic, Malebranche of the Burning Abyss to the grave, and when he activated the effect Chicas chained Maxx “C” from his hand. 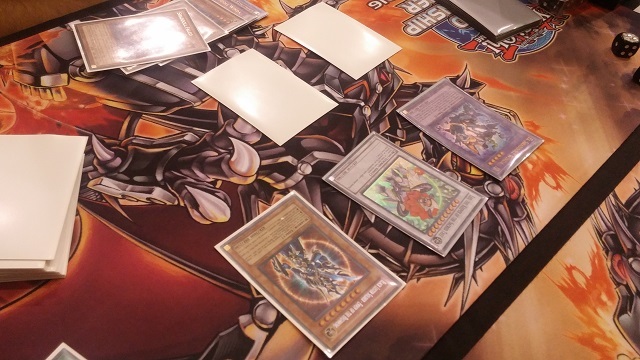 Cunningham Special Summoned Scarm, Malebranche of the Burning Abyss in defense position. He attacked directly with Mathematician and Set Fire Lake of the Burning Abyss before passing. Chicas Normal Summoned Performage Trick Clown and attacked Mathematician. Cunningham drew Breakthrough Skill with its effect. Chicas Set one backrow and passed. Cunningham drew Skill Drain. He Normal Summoned Graff, Malebranche of the Burning Abyss and Chicas used Book of Moon on Scarm. Cunningham chained Fire Lake of the Burning Abyss targeting Chicas’ face-down backrow and Performage Trick Clown, and Chicas lost Vanity’s Emptiness. Trick Clown revived itself and Cunningham Special Summoned Cir, Malebranche of the Burning Abyss from his Deck. It attacked over Trick Clown. Cunningham Set Breakthrough Skill before searching Rubic, Malebranche of the Burning Abyss in the End Phase. Chicas activated Soul Charge to bring back Performage Trick Clown. That dropped him to 4500 Life Points. He then Normal Summoned Performage Damage Juggler and Xyz Summoned Castel, the Skyblaster Musketeer. He used its effect but Cunningham chained Breakthrough Skill. Trick Clown was Special Summoned back to the field and Chicas banished Damage Juggler to add Performage Hat Tricker to his hand. He Special Summoned it and made Abyss Dweller. He passed. Cunningham drew Karma Cut. He Special Summoned Rubic from his hand and Chicas used Abyss Dweller. Cunningham negated it with Breakthrough Skill, though, and then proceeded to Synchro Summon Virgil, Rock Star of the Burning Abyss. Cir, Malebranche of the Burning Abyss Special Summoned Graff, Malebranche of the Burning Abyss from the Graveyard and Cunningham followed it up with Virgil’s effect on Castel, discarding Scarm, Malebranche of the Burning Abyss. He attacked over Abyss Dweller with Virgil and Chicas brought back Trick Clown. Graff, Malebranche of the Burning Abyss ran it over in battle, and Cunningham Set Skill Drain and Karma Cut before searching Cir, Malebranche of the Burning Abyss in the End Phase. Chicas drew his next card and proceeded to pick up his cards. We’re going to Game 3! Chicas opted to go second. Cunningham opened with two Dark Hole, Torrential Tribute, De-Fusion, and Mathematician. He Normal Summoned Mathematician and sent Scarm, Malebranche of the Burning Abyss to his Graveyard. He Set Torrential Tribute and De-Fusion. He searched Tour Guide from the Underworld in the End Phase. Chicas used El Shaddoll Fusion using Performage Damage Juggler and Shaddoll Beast to bring out El Shaddoll Construct. He sent Shaddoll Hedgehog to the grave, drew a card with Shaddoll Beast, and then searched Shaddoll Squamata. He Normal Summoned it and then attacked over Mathematician with it. 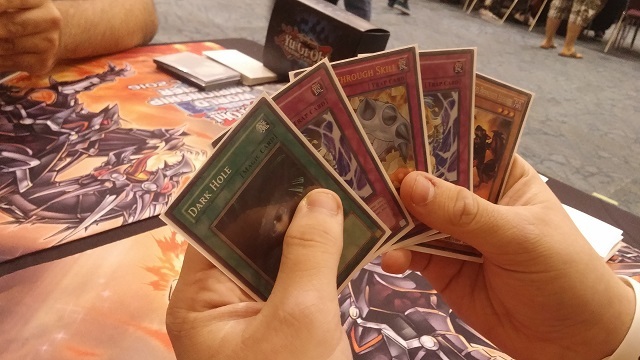 Cunningham drew Skill Drain and then Chicas attacked with El Shaddoll Construct but Cunningham used De-Fusion to send it back to the Extra Deck. Chicas Set a backrow and passed. Cunningham drew Breakthrough Skill. He Normal Summoned Tour Guide from the Underworld and brought out Graff, Malebranche of the Burning Abyss. He Xyz Summoned Dante, Traveler of the Burning Abyss and detached Graff to mill Rubic, Chaos Trap Hole, and Scarm. He Special Summoned Cir, Malebranche of the Burning Abyss from his Deck. Dante, Traveler of the Burning Abyss attacked over Shaddoll Squamata and Cir, Malebranche of the Burning Abyss hit directly. Cunningham used Dark Hole in Main Phase 2 to destroy his own Dante and Cir, and he Special Summoned back the Dante, Traveler of the Burning Abyss after adding a Graff, Malebranche of the Burning Abyss to his hand. He Set Breakthrough Skill and Skill Drain before searching Cir, Malebranche of the Burning Abyss in the End Phase. Chicas banished Performage Damage Juggler to add Performage Trick Clown to his hand. He then activated Shaddoll Fusion and chained his Set Shaddoll Core, and when the chain resolved he Fusion Summoned El Shaddoll Construct using Core and an in-hand Beast. Cunningham responded with Breakthrough Skill and Chicas drew a card after adding back El Shaddoll Fusion. He Normal Summoned Mathematician and Cunningham responded with Skill Drain! Construct attacked over Dante, Traveler of the Burning Abyss and Cunningham added back Scarm, Malebranche of the Burning Abyss and Mathematician attacked directly. Time in the Round was called, and Chicas used El Shaddoll Fusion to summon another El Shaddoll Construct using his on-field one and a Trick Clown in his hand. He brought back the Performage Trick Clown and lost his entire field to Torrential Tribute! He added back Shaddoll Core. He Set two backrow and passed. Cunningham drew Foolish Burial. He activated it to send Graff, Malebranche of the Burning Abyss to the grave, and that got him a Farfa, Malebranche of the Burning Abyss. Next, he Normal Summoned Cir, Malebranche of the Burning Abyss and Xyz Summoned Number 30: Acid Golem of Destruction. It attacked and Chicas responded with Shaddoll Core to block the damage. He passed after that. Chicas used Shaddoll Fusion to send Shaddoll Dragon and Performage Damage Juggler to Fusion Summon El Shaddoll Construct. Dragon destroyed Skill Drain and Chicas banished Performage Damage Juggler to add Performage Trick Clown. He Normal Summoned it, and Special Summoned Black Luster Soldier – Envoy of the Beginning! Its effect activated to banish Number 30: Acid Golem of Destruction and Cir, Malebranche of the Burning Abyss and Farfa, Malebranche of the Burning Abyss activated. 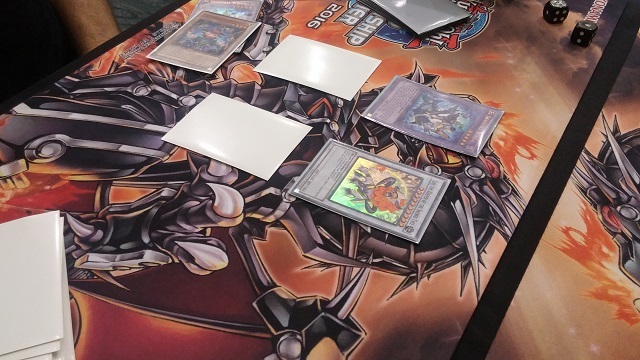 Cunningham Special Summoned Graff, Malebranche of the Burning Abyss and El Shaddoll Construct was banished, and then Trick Clown attacked over the Graff, which allowed Cunningham to Special Summon a Cir, Malebranche of the Burning Abyss from Deck. Chicas Set a backrow and ended. The El Shaddoll Construct returned to the field. Cunningham drew Libic. He activated Dark Hole to wipe the board. Shaddoll Fusion was added back to Chicas’ hand before Trick Clown and Rubic were Special Summoned to opposite sides of the field. Cunningham Normal Summoned Graff, Malebranche of the Burning Abyss and Synchro Summoned Virgil, Rock Star of the Burning Abyss. He Special Summoned Barbar, Malebranche of the Burning Abyss from his Deck. He used Virgil discarding Scarm, Malebranche of the Burning Abyss to shuffle back one of Chicas’ backrow cards. Then he Special Summoned Libic and attacked, causing Chicas to extend the handshake!